Voted Baltimore’s Best Health Club four years in a row, Merritt Clubs has been making Maryland healthier since 1977. Today they have nine locations, each one geared toward the community it serves. They approached us for a rebrand of their entire business. We needed to review all aspects of the company and come up with a new brand architecture. 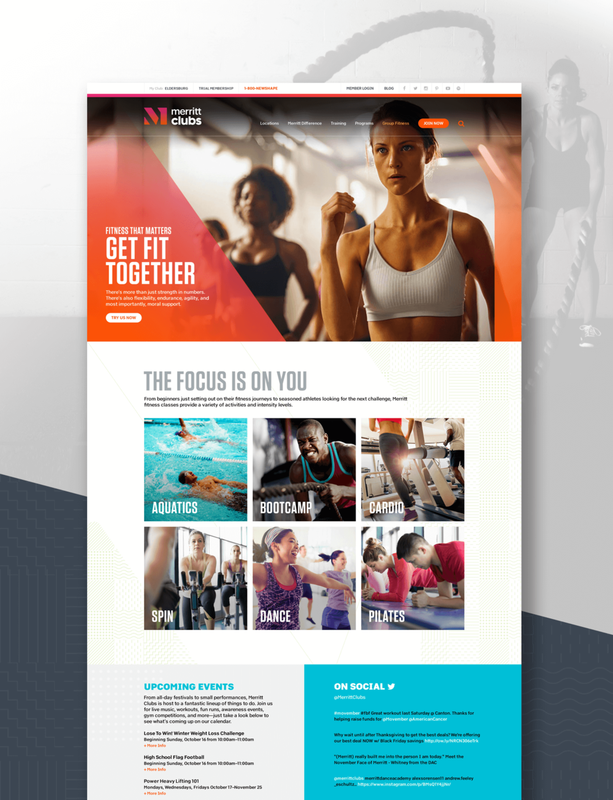 The new clubs’ website needed to improve the experience for gym members as well as future prospects. I was the lead designer in taking the bold new brand and creating a unique digital experience from information architecture, wireframing, page design and managing the development. Merritt Clubs had amazing results after the launch with the new brand, an improved website experience, and a more purposeful approach to marketing. They saw a 44% boost in overall lead volume from the previous year and continue to exceed many other KPI’s, year-over-year lead growth went up 39%, website visitors up 37% and page views up 28%.